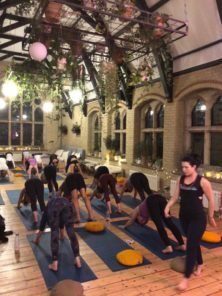 SoulJourn Yoga from NY came and gave a fantastic YOGA lesson at our recent fund raiser in Shoreditch London. We had a wonderful group of guests and some fantastic sponsors for the event. Set in the beautiful 42Acres studio, the attendees left with a well stocked goodie bag filled with healthy snacks and beauty products.